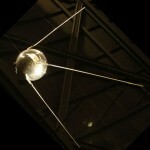 Sputnik I replica. National Museum of USAF. Eric Lee-Johnson. ‘Night sky, Waimamaku’, 1957. Gelatin silver print. Purchased 1997 with New Zealand Lottery Grants Board funds. Te Papa. Sputnik was about half a metre in diameter and therefore only really visible through a telescope, but its signals were heard by amateur radio enthusiasts around the world, and one of its spent rocket booster stages could be seen orbiting in tandem with Sputnik by the naked eye. New Zealand photographer Eric Lee-Johnson took a time-lapse shot of the trail of this rocket stage as it orbited the planet. He sent the photograph off to Life magazine but was beaten to their news desk by a Canadian photographer. It was published in our own Weekly News though, appearing a fortnight before publication in Life. Could Lee-Johnson’s photo be the first published visual evidence of Sputnik? More research is needed. Vanguard followed Explorer, but Echo was the one I dimly remember from childhood. Echo I and Echo II were launched in 1960 and 1964 respectively and could easily be seen crossing over Wellington on a dark night. The reason for their visibility was size: they were essentially huge balloons made of metallised mylar that were inflated once in space. Again they didn’t do a lot, serving simply as reflective objects for bouncing off radio waves. Today you can see plenty of satellites crossing the sky at night. Because their orbits are known with great precision (no pencil and paper calculations these days) you can catch up with your favourite satellite with spotting timetables. One of the easiest to see is the International Space Station, as it is brighter than any star or planet: ISS timetable. Flashes of light from the Iridium satellites are worth looking for too: Iridium timetable (be sure to enter your location at top right). Telstar is another notable satellite from the 1960s, etched in my mind by the 1962 worldwide instrumental hit of the same name by UK band The Tornados. The satellites (again there were two) were the first to relay television across the world and seemed to mark the beginning of a whole new, technologically based, future. This was perfectly matched by the music, claimed to be the first pop music to use a synthesiser – actually an electronic keyboard known as a clavioline and to mark the beginning of techno-pop. The sound is rather dinky and the tune slightly irritating (retro ringtone anyone?). UK prime minister Margaret Thatcher apparently claimed it as her favourite pop music, which may say something. A better place to end on the subject of satellites and music might be Lou Red’s sing-along Satellite of love though. This is no. 5 in my series on UFOs, aliens and outer space related to photographs held in Te Papa’s collections. Other posts include: Alien power source; Confusing circles; New Zealand’s Roswell; Miniature alien invaders; Getting close to the moon; Rabbits on Mars; Aliens: Here Already? ; Nostalgia for the Future. Thanks for this Athol. I always enjoy seeing Eric’s photographs from this period of his work. And mention of Sputnik jogged a memory for me. Being older than you by x number of years I remember it well. One teacher at my school used the ‘art’ period to have his class make sputniks which were all painted in silver paint and pinned to the ceiling of his classroom – at various heights. It made a very effective presentation. My memory, early 1960s, is of toy spacecraft in Wheetbix or cornflakes packets and swapping them with other kids. They were grey and I specifically recall a cone-shaped one, probably Sputnik II. This was the one in which poor Laika, the first space dog, was fired into space on a one-way mission. The whole space dog business is an interesting saga in itself.